Tim Mullooly: Welcome back to Living With Money, This is Tim Mullooly. On today’s episode, I’m joined by John Lanza. John is the creator and the Chief Mammal at the Money Mammals, and also of Snigglezoo Entertainment. John, thanks for coming on the podcast. John Lanza: Thanks for having me, Tim. Tim Mullooly: Before we dive into the Money Mammals program, do you first want to tell the listeners about yourself, a little background, how you got started in your career, and what led you to where you are today? John Lanza: Well, I started … we now have two girls, my wife and I. Two girls 15 and 13. And back when the 15 year old was very young baby, we were talking about what we wanted for her. One of the things that we kept coming back to was the importance of teaching her to be money smart down the road. I came from some entertainment, I had also been a camp counselor so kind of working with kids was a natural thing. My first thought on trying to teach kids about money was, “Well, let’s take something that on its face is pretty boring and make it fun for them.” And so we looked into it and realized that one there wasn’t much out there doing that. And two, it made a lot of sense to start early. One of the obvious things as she got older that we realized is … and when I say older, I mean two and three. And then our younger daughters as they got older, you realize very quickly that kids are exposed to the spend message from a young age. So it really became obvious to us that this was bigger than just our kids. And if we came up with something that can make it fun for her, it might make it fun for other kids, and we might be able to move along to raising … helping parents raise a generation of money smart kids. Tim Mullooly: Was there a certain moment in time or was it like you’re saying kind of just a natural progression of realizing that, hey, other kids and other parents might be interested in that? Was there a certain moment where you came to the conclusion that you needed to start this program, The Money Mammals? And how long did it take to get the entire program running? Tim Mullooly: Once you kind of got his seal of approval, how long did it take you to build out the entire program? Or was it a work in progress as things got started? John Lanza: Well, our first … so I came from animation. I didn’t want to do an animated show, I wanted to do something that I knew I could produce relatively inexpensively. I’d always wanted to do something with puppets, I had this character … the main character is Joe the monkey. And I had had a character, a monkey character in my head, whose name is Joe. And now he actually finally had something to do. I called up my brother to write some songs because he’s really good songwriter, funny guy. And then my wife and I, and my brother said, “Well, you know it’s puppets, we could just be the puppeteers.” You know, that’s the ultimate hubris right there. We took one … we hired a guy to teach us like one lesson of puppeteering, wrote a show, and produced a show that was absolutely terrible. I mean, by the end of the first night of shooting my brother and I were talking to each other, it was a very trying weekend of attempting to pull this off. And we tested it out a lot, it was really a complete disaster in the actual productions in the sense that we didn’t come up with anything we could actually release. But it was … we realized that we actually did have something here, we just needed to hire real puppeteers and build out a better script. I brought in an advisor, and that’s exactly what we did. And that’s where how we created the Money Mammals. Tim Mullooly: Oh, that’s awesome. The core mantra for Money Mammals I read is, “We’ll share, and save, and spend smart too.” Do you want to talk about why you chose that specifically as the mantra, and what it means for the kids as they go through the program? John Lanza: Sure. We wanted to focus on … everything we do is really trying to keep things simple. And for the kids, we wanted something that they could sing and that would be meaningful, and the share and save and spend smart tie into the three jars that we would want them to set up. Once they decide, they watch the money mammals are excited about it, and want to be like Joe the monkey and they set up their share jar for charitable giving, and the save jar for saving for longer term goals, and then the spend jar. But adding the smart I think was really important, it’s not just kind of semantic game. The idea there is we want kids to be thinking, to be mindful about their spending. And that’s why they sing, “We’ll share, and save, and spend smart too.” Because we wanted to … the thing is kids at the young age of say, two, and three, and four, they’re getting tons of messages that are really focused on just the consumption side of things. So we wanted to do something that was just as fun, just as catchy, but to give them the opportunity to think about something to do with money that wasn’t just consumption. That was sharing and saving as well, and that was the idea behind it. Tim Mullooly: Adding that smart in there too was big because you can teach habits to how to save and how to spend, but they might not be smart habits. John Lanza: Exactly. And that being mindful is really important. The other thing is you set up the fact that you’re making choices with your money all the time, because this is a really important lesson for kids to learn. And in fact, the three kind of core money smart skills that kids should learn, are distinguishing between needs and wants, setting and saving for goals, and then making smart money choices. And that last one, making smart money choices is really important because whether kids are actively making a choice or not, they are making a choice. They may not know they’re making a choice. The advantage of putting them into a program that has an actual kind of approach or purpose to it is that they learn that when they take their money and they decide they’re going to spend it and not take a portion of it and save it, and portion of it and share it, that there is a decision that’s being made. And so the idea is you want to give them the opportunity to make those decisions as regularly as possible so that they do understand that they are making choices every time they get money. Tim Mullooly: Right, exactly. When you’re getting started with this program and teaching kids about money, are those some of the foundational core building blocks to learning about money? And are there any other building blocks that the program starts with and builds upon from there? 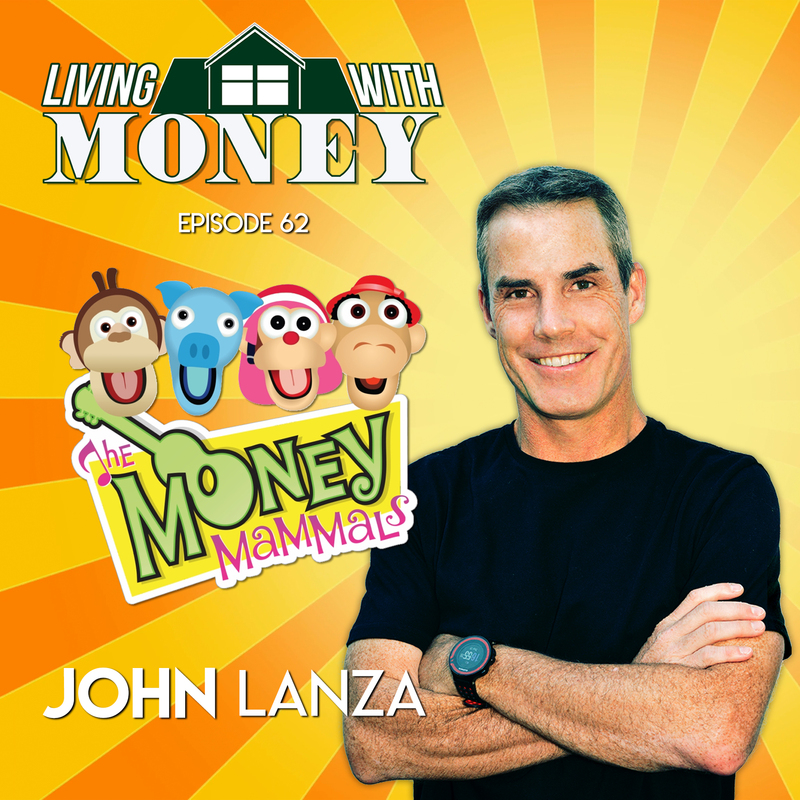 John Lanza: The Money Mammals gets kids excited about the basics, setting up the three jars, talking about the sharing and saving and spending smart. I realized after a number of years of watching kids get excited about it, and implementing a program at home for our kids and, and talking to and working with other parents about implementing their own programs at home, I realized that the key element here is the kids get excited but there needs to be a plan in place for the parents. There needs to be something so the parents know how to capture the excitement and turn it into something real. And so that’s why I wrote my book, The Art of Allowance which came out in 2017, and that’s where I identify those three core money, smarts skills, so that again, just like we focus on the simplicity for the kids, we want to focus on the simplicity for the parents. We want to make it really easy for people because you don’t have to be a money expert to be able to teach your kids about money. I’ve never run into a single parent who hasn’t answered yes to the question, “Do you want to raise a money smart kid?” They all do. Right? John Lanza: And what they’re lacking is a program, and so that’s what the idea behind The Art of Allowance, and the those three money smart skills I talk about a lot in the book. Those are the setting and saving for goals, distinguishing between needs and wants, and making a smart money choices. What’s nice about those is those are easy things for all of us who aren’t always following the advice that we may be giving to our kids, we can change our own behaviors. I found in the process, that’s I’ve learned just as much probably teaching my kids about money as they have. Tim Mullooly: Yeah, absolutely. As a financial planner, I have to agree. Some of the concepts that we’d be teaching our kids, we could also be teaching some of the adults as well. What would you say is the best age to start teaching kids about money? And is there a point where it’s too early? John Lanza: I don’t know that there’s really a point that it’s too early to discuss it certainly if it comes up, if the kid is looking at money or is interested in money. Here’s the way to think about it I think, so, you’re … Someone who’s listening is thinking, “Well, I’m not going to talk to my one year old about money.” The idea here is you actually might talk to your one year old, or your two year old about money, not in the sense that they’re going to understand it. But think about it like this, we all know as parents now that we read to our kids from a super young age. I remember Barack Obama saying he read to Malia and Sasha as soon as they were born. We did the same thing with our kids. The concept behind that is called emergent literacy, and we now know that reading to our kids from a young age you’re providing the foundation for later literacy that reading and writing. Same thing exists in financial literacy, that it actually is a term of emergent financial literacy, and exposure to money language as early as possible is a good thing for kids. That money language doesn’t have to be about compound interest, that money language can just be great … the money language can be visual, so going to the store, seeing you make some change with some money rather than just using the card to swipe, giving them $1 to purchase something and get the change. Again, if they’re two or three they aren’t necessarily going to be able to calculate any of this stuff, that’s not really the point. The point is just exposure to the feel, and to the language, and to what exchange is about. All of those things are part of the … you’re providing the foundation for later actual financial literacy and learning. Tim Mullooly: That makes perfect sense, kind of piggybacking off that though, if a parent is listening to this and said, “Well, my kid’s not two or three, they’re 13 or 14, they’re teenagers.” A little past the curve here. Is it too late to teach them about money? And does the process change, if at all? Obviously, you can use bigger words speaking to a teenager. But does the process change at all? Or is there a point where it becomes too late? John Lanza: I don’t think there’s a point where it becomes too late. I think it’s certainly better to start early, and that’s why I’m glad that we’re having this conversation so more people can become aware of the importance of starting early. But I think maybe what I should do is go back and identify how you might set up an allowance for a younger kid, and then we could talk about how you would make that allowance grow for an older kid, and then we can kind of piggyback into how you would do that if you hadn’t started allowance for a younger kid. Does that make sense? John Lanza: So like a basic allowance that you would start … and five years old is a good time to start that. Hopefully you’ve had some initial conversations with them young, but most of this is just don’t over worry it just get started on the conversation. Because what you’re trying to do with an allowance is open up a money conversation, kind of lifelong money conversation with your kid. So we set up those three jars, we talked about the share, and the save, and the spend smart, we give them an allowance. So let’s say a five year old is going to get $5 per week, that’s a kind of rule of thumb is $1 per week per age of the child. With that $5, you would have them … automatically opt them into putting $1 into the save jar. That’s like the concept that you know as a financial planner, which is pay yourself first. You’re teaching them that this is a good thing. And so we make that automated, they have no choice, which I’m sure as a financial planner, you also try to automate that for adults, right? John Lanza: Yeah. And then we do the same thing for share. So we put another dollar into share. So they don’t have any choice over that in the beginning because we think that’s good for them, and that’s part of what the purpose of the allowance. So that’s $2, they have $3 leftover, that’s their discretionary money. And that can go into any of the jars including the spend smart jar, and then the way they can use that money is the share jar as they accumulate money there can be used for charitable giving, and the save jar can be used for longer term items. You will do this on a weekly basis, or you can do it by weekly, however you want. I think it’s a good idea to do it weekly. It’s also really, really important to be very explicit about the purpose of the allowance for your kid, to say, “We are giving you this allowance so that you will learn to become money smart, to learn to make these money choices.” You want to keep that language going. They’re not going to fully grasp everything until they do, and they will quicker than you might imagine. But you do want to be purposeful about it so that they know that you’re watching what they’re doing. With regard to that discretionary money you have to let them make their own choices. They’re going to make some mistakes, but the advantage of the mistakes is that they’re making these mistakes in a really low stakes environment. That’s their money, so now when you go to the store when they ask for something you will say, “Well that’s …” unless it’s something that you would be getting normally for the family, food for dinner, or whatever it might be. But if there’s something they want then you say, “Well you use your money.” Now if that’s the first time they’re getting their allowance, they may throw a tantrum. Those tantrums go away as long as you stick to your guns and say, “No. Listen, if you want something that you don’t have the money for then you need to save it, and when we get home I can show you how to set that up in your save jar.” And then what you do is let’s say that it’s something that’s $20, so it’s something that they can’t buy with the spend smart money that they have. Then you put you put a picture, we set up a SMART goal. Do you know what a SMART goal is Tim? Tim Mullooly: Like the acronym for S-M-A-R-T? John Lanza: Yes. So for your listeners just in case they don’t know, you set up a SMART goal and that is Specific Measurable … this is the smart S-M, and then A is for Attainable, R is for is for Relevant, and then T is for Time based. You do all those things on a little picture that you put on the Save jar. You do specific, it’s going to be whatever they want to buy. Measurable, how much is it going to cost. Attainable, for a younger kid, you don’t want to be shooting for something that cost $200. If it’s something like that you say, “That might be something for the holidays.” But if it’s let’s say like a scooter that’s 20 or $24, that’s doable over the course of say four to eight weeks for them. So that’s going to be attainable. Relevant, it’s going to be relevant to them because it’s something they want. And then time based, you tell them how long it’s going to take them to save. That way every time you get to allowance you can point to that, they’re more likely to take their money … because you can say, “Okay, well, you can put your money in the spend smart jar, or you could funnel some more money into the save jar and get closer to your goal faster.” So it opens up a whole conversation about setting and saving for goals, and just think about how much more powerful that becomes, and that’s all from just starting with an allowance. That all make sense? Tim Mullooly: Yeah, it absolutely makes sense. You’re saying, just getting that conversation going, getting the wheels turning in their head to get them thinking about these concepts is half the battle, I think, and just getting them started and compounding those lessons over time really would just hammer all of these points home. John Lanza: Yeah, and that’s the … you hit on the key point, which is that you’re opening up this conversation, and that’s the beauty of this. There’s going to be conversations that open up consistently, and you’re going to have these opportunities to have these discussions with your kids that come up about various financial topics. Let’s move towards the kids as they get older, they are going to … let’s say get to be six, then they get $6 a week, and seven, so on up until say that around 10 or 11. Then it’s time you could do what we call set up a breakthrough allowance. Now with the breakthrough allowance, they’re going to get more money but they’re going to have more responsibility. What we did is we set it up so that they’re responsible now for their own clothes, their own communication, so the extra money that we get charged for a phone, if that’s something that you’re doing as a family. They have to buy any additional food. So if they go out … they don’t have to forage for their own food at the dinner table. But if they want to buy lunch at school, or if they want to go out with friends, that’s going to be included in here. And then also gifts for their friends. We actually have a little downloadable Google Sheet that you can grab and set this up yourself. So you set it up and you get an annual cost, divide that by 12, and now you’re going to be paying them on a monthly basis for this. Now, their allowance is going to go up, but they are going to … they’re going to get more money, but their responsibilities are much higher. If you feel like that’s too much responsibility, you could start with one of them. So you can start with the gifts, you can start with the clothes, whatever it might be. The advantage here is that now they’re going to be paid on a monthly basis, so they start to understand what it’s going to be like when they get paid for a job where they’re going to get paid every two weeks, or maybe every month. And they have to get used to budgeting over a period of time, and they have more responsibility. And this is instead of now you having to dole that money out every time they ask for something. This is stuff that they are responsible and they’re much more mindful about their own money than they are about any money that you are giving directly to them that is not money that they really have control over. That’s the kind of setup for the breakthrough allowance. I want to say if you have any questions about that, let me answer those and then we can circle back to your question about starting with someone who hasn’t had the run up with the smaller allowance. Tim Mullooly: No. That whole concept of building over time and the breakthrough allowance, it all makes perfect sense. I mean, as they get older, and it’s more money obviously attaching more responsibility to it. It all makes perfect sense to me. For someone who hasn’t had that run up and is starting at a later point, where do they jump off? John Lanza: Yeah. The best way to do it, I think, is to start with a breakthrough allowance, but start with just one item. Whether it might be cloths, a good one might be gifts, that’s a good starting place. If you have an 11 year old or 12 year old and they they’ve not done allowance, then you could set that. You’re going to want to be just as explicit about it as you are with your five year old and say, “Listen, we’re giving you this to teach you to become money smart.” You’re going to get more eye rolls from a 10 or 11 year old than you are from a five. And that’s pretty easy, you just say, “You calculate how many gifts do you buy during the year for your friends?” And then identify how much that money might be, have a little negotiation about it. So if it’s like 20 friends, $10 for a gift that’s $200 over the year, divide that by 12, I’m not sure what that number is. I don’t have my calculator handy. But then that becomes the monthly amount. And then you start them out with that. Once they’ve done that, and you’ve had a few months of that, then you add in the other responsibilities. So whether it’s the communication, whether it is the clothes, you can build on that. Different kids are going to be different, and that’s the reason that I titled the book The Art of Allowance is that I just want to provide parents with a kind of guidelines for how to do it because every kid is different. Every kid within a family is different, every parent is different. You just want to set it up, however it’s going to work for your family. Some families are just going to decide, “What we’re going to pay for the phone.” Some families aren’t even going to let them use a phone. So these are just guidelines, so don’t throw the baby out with the bathwater if you don’t like a particular setup, just say, “Well, I don’t want to focus on that.” And focus on something else. So focus on having the gifts, and focus on paying for the extra food when they go out. Here’s what’s going to happen is, otherwise, you’re going to be doling out that money, and you tend not to track that money. And you tend to spend more money, if you’re dolling it out piecemeal. This is so much more practical because they’re responsible for it. So you’re not having to answer those questions on a consistent basis. You’re giving them responsibility on their own to make these purchasing decisions. Tim Mullooly: That all makes sense, and I like how you said … but you called it an art not … because it’s not an exact science like you’re saying, it’s more of an art. You got to you see what works for you, and use your own judgment to make things work for your family. In terms of ages when kids start learning about things, using money and being a consumer, how early do children start learning about things like that? Not necessarily that they are a consumer, but is it along the same lines? Same age as when you should start teaching your kids? Do they happen simultaneously? John Lanza: They happen pretty close. I mean, the fact is the kids … I think two year olds can recognize … I may have the ages wrong, but it’s around this age, it might be one year olds, can recognize like 200 brands. And the fact is that they are actively being marketed to by the time they’re two years old. They are aware. They’re not the ones who are making purchasing decisions, but they are certainly driving purchasing decisions because they’re being marketed to. So I would say at very, very young they are in the consumer mix. That’s the reason that I think it’s worth starting these conversations because conversation for a two or three year old might be the wrong word. It’s exposure to money language that’s something other than the spending because they’re going to get the spend language. So you want to be getting across the share and the save language, and the spend smart language. That’s the idea behind the the younger kids. It starts really early, it’s remarkable how quickly kids are indoctrinated as consumers. That’s just how it is, and that’s why we really advocate for starting this process early. And to your point about the older kids, that doesn’t mean that you can’t get things started for the older kids. Just get started as soon as you can with your kids because having money of their own is really an opportunity for them to practice before they are making super consequential decisions with money that could affect the rest of their lives. So give them a chance to practice when the effect is marginal. Tim Mullooly: When the stakes are low. Makes total sense. Regardless of when a family starts with their kids, in your experience, what have been some of the biggest mistakes that you’ve seen or heard about families making in terms of teaching their kids about money? Tim Mullooly: I’m sure there’s a lot. John Lanza: One is if you have the means don’t skimp on the allowance. If a kid’s getting like a quarter a week, they’re not going to learn anything about that, especially if you have the means to give them more. So that’s one because I think people are reticent to give them that responsibility, they might blow that money. But the fact is, you are their guide. You could certainly guide them. I’m not saying with regard to these mistakes that you just give them the money and let them blow it. You can certainly guide them, but you want them to be making their own decisions with the money. I think that’s one of the biggest mistakes that people sometimes they err on the side of not giving enough money when they can. Now, we also know that we’re very fortunate to be able to give the allowance that we give to our kids. You want to make it work, even in the case that you can’t give as much as you would like, you want to give them some responsibility over money. So if that’s your situation, then figure out a different amount that may be different than the dollar per week per age of the child. But that’s one big mistake. And then I think the other general mistake is that people feel like we’re all burdened with money mistakes that we’ve made ourselves, right. And we feel like we’re not qualified to teach our kids about money. But I am here to tell you that I am not a money genius. Those mistakes are actually not a bug, they’re a feature for you. Embrace those mistakes, talk to your kids about the mistakes. It’s perfectly fine to have a conversation … especially when they get older, when they’re younger, they’re not really going to understand the mistakes. But as they get older, it’s perfectly fine for them to know that you have made spending mistakes. But most importantly, you don’t want to let any kind of money baggage that you have hang over your family and lead you to not have the conversation that you most likely know you should be having with your kids. Embrace some of the issues that you’ve had, figure out a way to take that and turn those into learning opportunities for your kids. Tim Mullooly: Yeah, absolutely. And to that point that you were saying people don’t feel qualified to teach their kids about money, whether you feel qualified or not, somebody has to teach them about money. And right now in a lot of school systems, they’re not being taught money related topics. I mean, unless they’re using the Money Mammals program, not a lot of classrooms are teaching kids these money issues. So if your parents aren’t doing it, then who is? Right? John Lanza: That’s an excellent point, Tim. And that’s exactly right because, for example, here in California where I am, there is nothing in the curriculum that teaches financial literacy. So if you’re not teaching them, they are not … well, they’re learning it, they’re learning it. But they’re going to be learning it from their friends, from wherever else they might be getting it. But it’s so much better as a parent to be purposeful and intentional about teaching them, instilling your own values with your kids. A good example is one of the beauties of allowances you can instill an important value by using certain tactics. So like a good example is if charitable giving is a big part of what you do as a family, then incentivize that. At allowance time, you could say to your kids, “Listen, I’m going to match you dollar for dollar for every dollar you put in your share jars.” That’s doubling the power that they have for the share jar money, and then they’re getting the message that this matters to you. Of course, hopefully at the same time, you’re showing them that you’re engaged in charitable giving as well, and be explicit about the money that you’re giving to charity. Back to the kids, that little simple tactic of incentivizing or matching them dollar for dollar, it could be quarter for dollar, you could do that for the share jar, you could do that for the save jar. It’s a way of getting across what you think are important values to your kids. So there’s a real nice tactical part of this that can help you teach your kids some important values. Tim Mullooly: Right. Absolutely. One of those important values is being able to get kids to view money the right way. A lot of people think … and adults think this way too, that getting to a certain dollar amount in your bank account is the goal. How can parents ultimately get their kids to view money as more of a tool and not necessarily the goal to achieve? John Lanza: That is actually the overarching purpose of starting an allowance and this conversation, is to get them from this idea. So we teach them money smarts, to have them become money empowered. That’s how I think about money empowerment is that you now as you get older, you hold sway over money, money does not hold sway over you. One of the key lessons in there is just this idea … and I think it’s what you were getting at, that there’s, there’s never going to be a purchase of a thing that you make that is going to give you anything more than the dopamine hit that you get from that purchase. That’s not to say that there aren’t worthwhile purchases of things that you’re going to have. For the kid who becomes money empowered, they realize that, “I’m going to buy this thing because it serves a purpose, not because it’s going to make me feel like I’m a better person, or it’s going to give me some kind of status.” You can’t really … it’s very hard to have those conversations if there’s not some kind of money that the kids are using that it is their own money, right? Tim Mullooly: Yeah, there needs to be something tangible there for them to actually practically apply those lessons to. John Lanza: Yeah, and the other thing is just the idea here … I mentioned the beginning were opting them in, it’s called this concept called nudging them to do these things like sharing and saving. So when they get older and they start getting money, that’s going to be hopefully in the front of their minds, but certainly, at least in the back of their minds, is that, “Well, I’m getting some money coming in, I got to make sure that I’m paying myself first, I’m engaging in charitable giving, and then I’m being mindful of my spending.” And if you do this on a consistent basis, they’re going to be mindful. This is … and again, this is not to say that our kids are perfect money … are Paragons of financial brilliance right now, right? They’re still making mistakes. But that’s what this is, that’s really part of the whole process. They’re going to make some mistakes, and you’re going to guide them. The advantage of setting up an allowance is that now you have opened up a conversation, and given them some empowerment to eventually get to what you were talking about, which is that money empowerment where they look at money for all it is, which is for what it is, which is just a tool. Tim Mullooly: Along the same lines, parents if they can get their kids to view the money as a tool and not a goal, the next step I feel like would be distinguishing between wants and needs. John Lanza: I think on the need side it tends to be … that that’s something they will probably also discuss in school, and that’s something that you could just talk about as a family. The needs … most of the stuff that they’re going to be purchasing with their allowance are going to be wants right? John Lanza: Because you as parents just take care of your needs. The best thing that you can do as a parent is … in terms of understanding needs is have conversations with your kids. I know families that will do … we don’t do this on a consistent basis, but I know families that will sit down to have a Sunday conversation about the bill paying that they’re doing. So I think that’s an excellent idea. Some schools and the high school level will offer these financial reality fairs which are a great way to for kids to start understanding how their money is going to be spent when they get to do … when they when they actually have a job and they get out the real world. Finding something like that for your kid is a great thing to do. Focus of what’s going on with your allowance is going to be more on the wants side, and it’s on the need side that you just have to expand the conversation beyond those wants in whatever way works for your family. Tim Mullooly: That makes perfect sense because for a 10 or 11 year old they think that they need everything but in reality, like you’re saying most likely it’s just a want. The Money Mammals program works with credit unions to help spread the program and teach kids about financial literacy and money. Do you want to talk about how you got together with some credit unions to help spread that program? John Lanza: Yeah, we work with credit unions. We’re also opening up to community banks this year. With the credit unions, it was a natural fit. We had created the program, we were talking to an organization that really wanted something like this and it connected with the credit union movement. One of the, the tenants of it is that you need to provide financial literacy for your members who are the owners. And so the Money Mammals just was a natural fit. Our terrific partners, we have them all across the country will use the program to go into schools, they will also use it to really connect with families in their community in various different ways. Tim Mullooly: That’s awesome. Like you said, a really natural progression. It makes a lot of sense. We’ve touched on a little bit already in the episode, you mentioned the book that you published in 2017 called The Art of Allowance is geared more towards parents in that sense than the kids themselves to give them sort of a plan along with this program. Can you talk about what parents can hope to get out of that book? And also in terms of The Art of the Allowance, there are probably some myths that go along with giving children allowance. Do you want to touch on a couple of those myths and why they are just that, myths? John Lanza: Yeah, I think the biggest issue with allowance is that people feel like it is … it’s the weight of the word. So they feel like, “I’m not comfortable giving my kids an allowance because it’s a handout. I want to tie it to chores.” But here’s the thing, an allowance does serve a purpose. That’s why I’ve harped on this from time to time in our conversation is the importance of being very intentional and talking to your kids about it. So when you do start an allowance, you want to tell them, you want to say, “This is for you to become money smart. We’re going to watch and help you through that process.” That is the purpose of an allowance, and where allowances fail is when their parents don’t have a why behind it. Those are the basic core money smart skills the purpose here is to eventually get them to become money empowered, to use money as a tool. That’s the why behind the allowance. Once you have that why, you’re much more likely to stick with the program. You now know the reason that you’re doing it, and I think that’s where the programs sometimes fail is that they don’t have the why so it’s very easy to just say, “It’s not working out, I’m going to move on.” But when you know that there’s a higher purpose to what you’re trying to do, then you’ll stick to that allowance. I’ll weigh into the chores and allowance debate because it always comes up. We don’t advocate for time chores to allowance, and the reason is, is that chores teach a different lesson. It’s no less important lesson, but the lesson that chores teach is that kids … I need to work any, or you, anybody needs to work in order to earn money. Great lesson. But that’s different than teaching your kids to be money smart, and you don’t need to tie the two together. You can give them the opportunity to learn the chores lesson with larger chores that you might pay someone else to do, wash the car, mow the lawn, whatever that might be. But certainly for basic chores, you don’t need to pay your kids for those because they should just do them, just do them as part of living in the house. I think the reason people get hung up on it is that they don’t have the purpose to the allowance, that’s what I hope to get across the parents is that idea that there is a very strong purpose to the allowance. You don’t need chores to define its purpose, the purpose is that you’re trying to raise your kids to become money smart and eventually money empowered. Tim Mullooly: I feel like without that reason behind it that myth that you were talking about like, “Oh, it’s a handout.” Well, if there isn’t a reason behind it, then yes, technically I guess that is correct. But there needs to be a reason behind it so there so there’s actually a purpose otherwise they are just giving their kids money with no direction and not really teaching them a lesson. John Lanza: You’re totally right, it is a handout if there is no purpose behind it. That’s the reason why I think … because what happens sometimes if you don’t have that why is why are you setting up the allowance? You set up the allowance because that’s what you heard you’re supposed to do, or your parents did that for you. That’s not a reason to do it. A reason to do it is because you have a goal in mind, and the goal in this case is money, smart, and money empowerment for your kids. Tim Mullooly: Absolutely. Over this whole process, creating this program, writing these books that we’ve been talking about, for you personally what has been the most rewarding part for creating Money Mammals program? Writing books like The Art of The Allowance? John Lanza: That’s a good question. I think the reward has just been the journey of … because I think back to when we started the Money Mammals, our purpose was really so focused on these young kids, and just getting them excited. The progression into this credit union program, and then The Art of Allowance. So I guess it’s really the idea that we’re connecting with so many parents and so many families to provide them a way just like we’re doing with our kids to try to get them to this stage of money empowerment. So the journey has been fascinating and fun. You know, I have my own podcast where I get to talk to researchers who have done a lot of the bunny research, and the research that’s tied between money and … that talks about money and the tie to happiness. I find it endlessly fascinating, and it challenges my own assumptions consistent basis. I think that’s really important because there’s just so much more to learn about this whole process. The journey has just been super rewarding, and I figured that it’s going to continue to be a rewarding. Tim Mullooly: Yeah, I commend you for all of this work because it really is an empty space where there needs to be something there for kids. We hear about constantly, and I see it with clients, people come in and they’re getting ready for retirement, but they don’t have any money saved. And we hear about how people are in debt, and it’s … if we just started earlier with kids, and instilled this from such a young age, it could circumvent all of these problems that we face later on in life. It might be a tough question, if you could sum up in one sentence or two, the number one lesson that all parents should pass to their kids about money, what would that be? John Lanza: I’m not sure that there is one. But I will say that I think one of the great values of starting this this process of an allowance, of setting up an allowance is that it opens up this conversation with kids, because one of the reasons that there’s been so much difficulty around money is that it’s been a taboo subject for so long. Those barriers are breaking down, but they’re breaking down because of these conversations like we’re having right now. So I think it’s just that the opening up of a conversation with your kids, being vulnerable enough to share with them some of the issues that you have can be incredibly rewarding not only for your kids but also for you. Tim Mullooly: I have to agree with that as well. All right John, I got one more question for you. I like to wrap up every episode with this question for each guest. Tim Mullooly: Whether it’s a personal thing or professional, or maybe ties into both a little bit, what’s one piece of advice that you’ve received that’s always just stuck with you? John Lanza: The one piece of advice that I do remember from my grandfather, I put it in my book was the idea that you should try … it’s two pieces of advice, but it’s live beneath your means, and understand the power of compound interest. But it was delivered in one sentence, as I left college. I actually put it right at the beginning of the book, because I think that living beneath your means is such a key element. I haven’t always abided by that, particularly living in Southern California near Hollywood. But it’s good advice. It’s advice that we’ve passed on to our kids and we hope that they will heed it. Tim Mullooly: Yeah, and it’s definitely like you said it’s two things, but it was in one sentence because they really do go hand in hand. If you live beneath your means constantly, you’re going to see the power of compound interest right before your eyes. Tim Mullooly: All right John, that’s all the questions that I had for you. Thanks so much for taking the time to come on the podcast and talk with me. John Lanza: No problem Tim, I appreciate you shining a light on this, and I had a blast. Thank you very much. Tim Mullooly: For the listeners out there, we will link in the show notes to The Money Mammals website where you can check out the program, and more about John. And also will link to The Art of Allowance, the book that we mentioned in this podcast as well. And also will link to John’s podcast, so be sure to check out all of that in the show notes after you listen to this episode. So thanks for tuning into this episode of Living With Money. We’ll see on the next one.